Happy Friday! Hope y'all had a fabulous week and have some fun weekend plans ahead. I'm hoping the weather holds up because I'm supposed to be going into DC with friends! It's supposed to be high 60's tomorrow and sunny so I'm super excited to enjoy it. 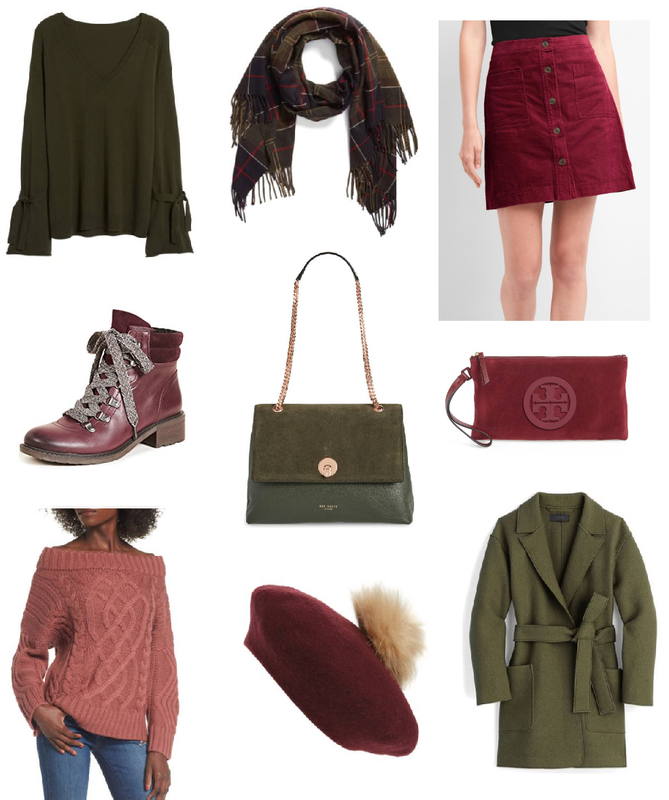 I have been OBSESSED with these two colors for fall not just on their own but I also love them paired together. I'm definitely normally a neutrals kind of gal but these are two colors I can definitely get on board with. How GORGEOUS is this bag from Ted Baker? I want it SO bad! I think it's so classic and I love the olive suede. Also have been looking for the perfect berry-toned skirt and I think this is the one! It looks like it's not too short and I love that it's corduroy. I love all of your picks. The olive purse is so cute! LOVE this Berry much!!! ;-) Such pretty finds! Have a great weekend girl! Such a pretty color combo and both perfect for fall. Love these two colors! I'm smitten with that skirt! lovely collection dear have a good day..
Lovely picks dear! That olive trench coat is sooo gorgeous!